If you have a destination in mind you can browse our property listings via the state drop downs at the top of the site. We list our properties by state and region to make it easy to find a property. If you have a good idea what you're looking for you may be better off using our property search utility. You can enter a region or suburb and we will show you those that match in our property portfolio. If you have a date in mind for your holiday, you can click on the CHECK-IN box to select the date you wish to start your holiday, and then the CHECK-OUT box to select your departure date. If you set these, you will only see the properties that available. So leave the dates blank if you are looking for a property but aren't concerned about the dates at this point. You can also specify the number of guests and pets you will by holidaying with. If you set these, you will only see the properties that can accommodate the number of guests and pets you have specified. Click the SEARCH button to list the properties that match your criteria in the area you intend to go. Once you have a listing of properties, you can further refine the listing via the REFINE LISTING button. You can use this form to specify a particular suburb in the region being listed, along with your check-in and check-out dates. You can also specify the number of guests and pets your will be holidaying with. If you want, you can also be more specific by expanding the PRICE, AMENITIES AND FACILITY filter selections. In amenities you can use these filters to specify properties that allow pets inside, free WiFi or linen and the like. In facility you can specify air conditioning, swimming pool, fireplace and such. Once you have selected your requirements, use the SEARCH button to relist the page with those filters imposed. Why can't I find a pet friendly property I know of? The holidaypaws.com.au site is a new site and we are working on hard on listing all the pet friendly properties that we can. As you can imaging, it's a big job and takes time. If you're keen to see a particular property on the site then get the property owner to check out the site and get in touch. When I search for something no properties are listed. Why? This usually happens because you are being bit too specific in your search. It's best to start your search by only specifying the destination and perhaps the property type. Then once properties meet your search, you can be more particular by specifying one or two of your preferences to whittle down the search. What are the dates in the search box for? By specifying the dates for your intended stay, we can limit your search results to only those properties that are available at the time. Where do I go to to make a booking? Our listing pages will show you a snipit of information about each property. Once you find a property in a list that meets your requirements, you can click on the DETAILS button to get more information about the property. If you are using a mobile you will find a quote form below the property information, otherwise it will be on the right hand side of the property detail page. If you have already fetched a quote for a property during your visit, a quote will have already been fetched with your previous settings for this property. You can change the dates, guests and pets to fetch a new quote. Otherwise, select your dates, number of guests, pets, and click the GET QUOTE & BOOK button. If your criteria meets those applied by the property manager, you will receive a quote for your stay. The quote will include details of your stay along with a quote and payment schedule. If you are happy with the booking details and quote, you can click on the BOOK NOW button at the bottom of the quote to load our booking page. 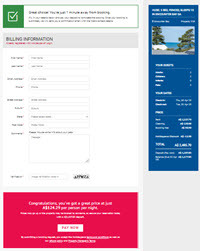 Our booking page requires your billing information, including name and address information. The property manager requires this information so they can manage you booking. Once you enter your details, click on the PAY NOW button to proceed to our payment page. Your card will be charged and the booking will be sent to the property manager when you click the BOOK NOW button at the bottom of the booking form. How do I get a quotation for my holiday? You can request a quote via the quote form provided on the property details page. The quote form will be under the property details on a mobile. Otherwise it will be on the right hand side of the page.You will need to enter the dates for your holiday, along with the number of adults, children and pets. If your dates and number of guests meet a few rules pertaining to the property and the property is actually available for your selected holiday period, then a quotation will be provided. If you are happy with the quotation you can then proceed to our booking form to secure the property for your holiday. How much to have to have to pay and when? When you book your holiday through www.holidaypaws.com.au you will be asked to pay the a deposit. In some cases your deposit will be for the full amount. This is usually where your stay is within the next month or so. 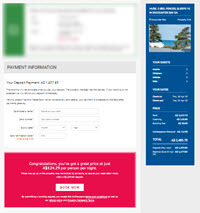 We will show you the amounts and due dates for the deposit and balance in the quote and on our booking page. Your payment can be made by credit card via our secure payments gateway. Your booking will not be confirmed and your holiday dates secured until you have completed your payment. You will receive your booking details via email when you complete your booking. Once your booking is submitted it will be managed by the property manager. They will be in touch via the phone number and email address you provide in your booking. The property manager will arrange payment of any remaining balance for your booking. If for some reason your booking is subsequently canceled, any refunds due will be handled by the property owner in accordance with their terms and conditions. These terms and conditions are provided with the booking confirmation we email to you. You can also review the Holidaypaws and property owner's terms and conditions via the links provided on the Holidaypaws booking form. How do I post a review for a property? The first point about posting properties reviews on www.holidaypaws.com.au is that you can only do so if you have booked your stay at the property via our site. All reviews are moderated by the Holidaypaws team, so please allow 24 to 48 hours for your review to become visible for the selected property. We will be in touch via the email address you used when submitting you review. We'll let you know when it is visible. How do I post my comments to the site reviews on your home page? We are keen to receive comments about the www.holidaypaws.com.au. Weather they are good, bad or indifferent. These reviews help us deliver the best possible outcome for both our holiday makers and those who list their pet friendly properties on the site. Please allow 24 to 48 hours to moderate your review and get it posted to the web site. How do I get my pet friendly property listed on Holidaypaws? You can find a link to our listing request form at the bottom of our home page, or click here. How much does it cost to list my property on the Holidaypaws website? It is absolutely free to list your property on the www.holidaypaws.com.au website! Please keep in mind we only lost pet friendly short term stay holiday properties. There are NO set up fees or subscription fees to list your property on our website. We do not charge anything for promoting your listing on our website. We will include your property in our 'Just Listed' section for 30 days. It will also appear in our Featured Properties section as well. We randomly select the properties that appear in these sections. We do not have a basic and enhanced listing. We strive for a site that is easy to use, all properties are presented in the same fashion. We do not manipulate search results within our website. Properties are sorted by either the latest listing or oldest listing depending on your visit time. You can then specify your preferred sort order, name, location or price. Some sites will promote properties by pushing them higher on search results. We do not do that. Who is Holidaypaws and what we are about.